There’s been a sea change, of sorts, in the way substance abuse treatment is viewed by commercial health insurance providers. Take Aetna, for example. On the company’s website, it plainly states that “all of our members have the right to receive timely access to medically necessary behavioral health care services.” For Aetna policyholders who are seeking residential addiction treatment centers that accept their insurance, they have a broad network of providers that can meet those needs. As one of those in-network facilities, Cornerstone of Recovery accepts patients with Aetna policies, and we go to great lengths to navigate the minutiae of behavioral health guidelines and coverage requirements. 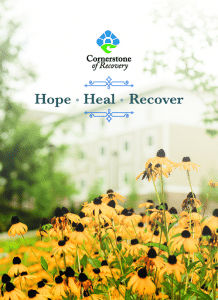 At Cornerstone, it’s important to us that you begin this life-changing journey without the stress of an impending financial burden, which is why we work closely with your insurance provider to ensure that the money you’ve paid for so long provides quality addiction treatment for you or a loved one on your policy. Why Does Aetna Pay for Addiction Treatment? Before 2008, health insurance companies weren’t required by law to cover mental health or substance abuse treatment. As a result, millions of Americans did not have access to the financial safety net needed to pay for drug and alcohol rehabilitation. Starting with the Mental Health Parity and Addiction Equity Act (MHPAEA) of 2008 and continuing with the Affordable Care Act of 2010, government-funded, private and group health insurance plans are now required to provide the same level of treatment benefits for disorders like addiction alcoholism as they do for ailments such as lymphoma and diabetes. In addition, those without government-funded insurance or workplace health insurance can now purchase insurance plans on the Health Insurance Marketplace, a federal exchange of policies that are also required to cover behavioral health services, including emergency services, hospitalization, inpatient and outpatient treatment, detox services and lab tests. This means that providers like Aetna — which provides coverage to almost 39 million people — are required by law to pay for at least some of a policyholder’s residential addiction treatment. Why Use Your Aetna Policy at Cornerstone? While your Aetna plan may pay for some, or even all, of your substance abuse treatment, you of course want the best care for which your plan qualifies you. At Cornerstone of Recovery, we have almost 30 years of experience in treating addicts and alcoholics, and we’ve developed a reputation as one of the best treatment providers in the nation. That’s why several different safety-sensitive industries send their employees to us for treatment — we treat workers from five different railroads and four different airlines. It’s why patients at our facility may share a group with a physician or a nurse. It’s why they’ll also form close bonds with other recovering addicts from all walks of life and vocational stations. We believe that the answer to addiction is community, and through a combination of traditional 12 Step recovery and clinically tested neuroscientific therapies, we address the root cause of a patient’s addiction and help them develop an individual treatment plan that can provide long-lasting recovery once they leave our facility. Does My Particular Aetna Policy Cover Treatment at Cornerstone? We understand all too well that health insurance is expensive, and determining the exact nature of your coverage can be complicated. Fortunately, if you have an Aetna policy, we have Admissions and Utilization Review staff members who have extensive experience in working with Aetna, so that you’re able to begin the addiction treatment process without the specter of financial jeopardy distracting from your well being. We know that you can’t embrace the hope for the future we offer if the shadows of impending financial doom occupy the forefront of your mind. To that end, we urge you to give us a call at 865-685-4086. Let us help you examine the exact nature of your Aetna policy, determine the scope of behavioral health services it provides and put them to work giving you the best chance you have at a better way of life.